I'm longing for change. I've been in the Netherlands now for over 15 years. I've been living in the same house now since 2002. I've been struggling to live life in Dutch for more years than I care to think about and instead of getting easier it's actually getting harder; people expect you to speak flawless Dutch after 15 years in the Netherlands, but I don't. I can hold my own, I get by, but I still have to think about what I need to say. I've been through the culture shock curve and co e out the other side, unscathed. I feel more at home these days in the Netherlands than I do in Britain, yet I am still living a life in the middle, between two worlds. And suddenly I'm finding it to be exhausting. Maybe it's the years that have gone by that has caused my sudden lust for something new. Maybe it's a midlife crisis. Maybe it's reading Once Upon an Expat and being reminded that there's a whole colourful world out there to explore and discover. Maybe it's the fact that my husband's contract ends next year and so he's exploring new possibilities and he keeps talking about new lands, distant and not so distant places. Whatever the reason, the stage is set for new, for change. And yet if I cast my mind back 15 years my resolution to make big changes falters slightly. Moving to a new country is not easy; there's a new language to learn, a new culture to embrace, new ways to do things, new customs to adhere to, maybe a new currency to get used to, new bureaucracy - in short, new everything. And that's not easy. It's not the easiest choice to make, especially with kids in tow, like we'd have this time around. 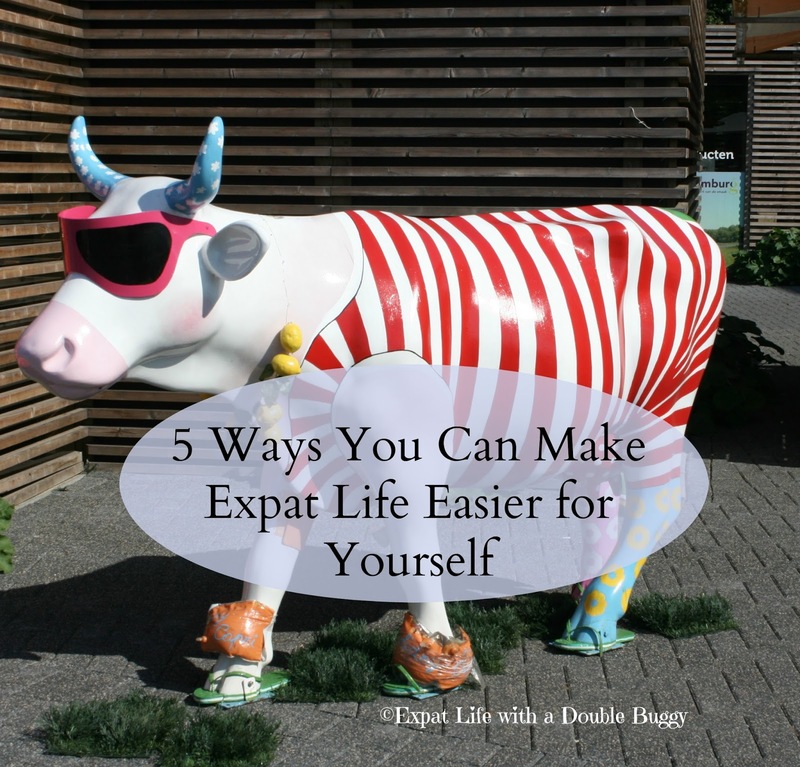 But you can prepare for expat life, and you can make it easier for yourself once you move. Here are five tips. 1. First time around I started learning Dutch before I moved - it's something I'd do again. Learning the language is the best way of connecting, integrating, of adapting. Without at least a basic grasp of the local language it's easy to feel isolated, to watch a world pass by that you are not a part of. So learn the language. 2. First time around I underestimated the impact that moving abroad would have on me and my life. It had implications for my career. It had an effect on my confidence and on how I felt every day for many months. Because the jump was a relatively small one (across the North Sea) it somehow felt like a minor move. It wasn't. How uprooting your life and transplanting it to another country impacts you is not based on physical distance. Countries can be next to each other but poles apart in terms of language, culture and approach to life. Don't underestimate the changes you will experience. When you move, whether you are a serial expat or a virgin expat it will be tough whilst you find your feet. But it does get easier as the months pass. Expect difficult. 3. First time around I knew nothing about a culture shock curve. I had no idea that how I felt and what I was going through when I first came to the Netherlands was a 'normal' part of expat life. It does all come to an end - the feeling of being alone, feeling like an outsider, of knowing nothing about how basic things work, or feeling depressed, that the move was a mistake or feeling frustrated because things aren't done as they are done 'back home'. If I'd known about the different stages of culture shock I would have given myself more slack and space during my first expat year for my feelings. Learn about the stages of culture shock. 4. First time around my biggest fear was leaving my family and friends behind and losing those bonds. In some cases those fears have been realised, but in other cases the bond is only stronger. And of course there are new bonds. We need to work at relationships, and some fall by the wayside as we go through life but expat life means there are new friendships to cultivate too. Remember you win and you lose. 5. First time around I had no idea what expat life would hold for me. I moved to be with a Dutch man - my decision to leave everything behind for one person could have come back to haunt me, could have gone horribly wrong. I could have ended up on a boat back to England feeling very sorry for myself. Could have. But didn't. Instead I have three beautiful Dutch sons, a Dutch husband and a Dutch life I love. Sometimes you need to jump. Sometimes you need to embrace change. Sometimes you need to take a risk and step into the unknown. And maybe next time I do it it will be as a family of five, and not alone. Great advice for expats and moving abroad. I admire how hard you have worked to learn the language. Sounds like you have itchy feet and a bad case of wanderlust! I wish you luck if a new adventure is on the horizon. Get Your Copy of Dutched UP! No post may be republished without permission. Awesome Inc. theme. Powered by Blogger.